I am linking up with Amanda for her new Friday Flashback Linky Party. I'm going to elaborate a little more on a post that I previously did, since I didn't talk a whole lot about it. 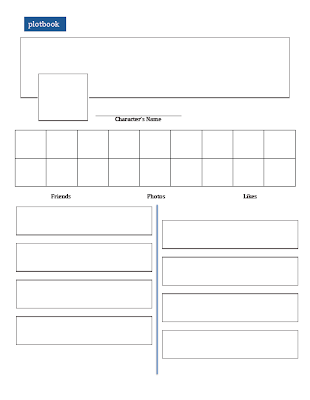 I created a Facebook page template that could be used with any story or novel. We are currently using it with Charlie and the Chocolate Factory. Click picture to download for free. The very top long rectangle is to draw a cover picture. We have not done this part yet because I'm saving it for the end. I'm envisioning a picture of the chocolate factory or a family picture. The smaller square at the top is for the character's profile picture. We drew a picture of Charlie Bucket. The two rows of small squares are for friends, photos, and "likes." The first six (first three in each row) are being used for friends. So far, we only have Mr. Wonka and an Oompa-Loompa. The kids argued that the other children were not their friends because Charlie would never want to be friends with those kids. I'm guessing that we'll fill in the other four with family members. Or we could do the chocolate shop owner where Charlie find the last ticket because he told Charlie to run home and not sell it. The next three in each row are for photos. So far, we have a picture of Charlie's house, a golden ticket, and the gates of the factory with a mass of people outside. Granted, they are tiny pictures, but they work for students because they don't have a large space to fill. The last three in each row are Charlie's "likes." So far, we have a bar of chocolate and something else that I can't remember right now. The rest of it is the timeline. We do a status update after every chapter. Technically, we should have started at the bottom and worked up so that the newest was at the top, but I think that would have been too confusing. This is where some of the students struggled. They wanted to write a summary of the chapter instead of Charlie's thoughts during the chapter. We did the first thirteen chapters together until most of them got it. We are now on chapter twenty-five, and all but one student has it down. She understands the summary part, but can't get it into Charlie's words. She is actually one of my better students, so I find that fascinating. Update - Here is our finished Facebook page. And now I have a question. What are the rest of you doing for Monday's mandated lessons about the Constitution? I like to read "We The Kids" or watch the School House Rock Preamble video. We briefly discuss what the Constitution does for our country. I think it'd be fun to write a Classroom Constitution! Great ideas! It really crept up on me this year, so I'm trying to get something together. Luckily our AEA delivers Monday morning! I LOVE this idea for a graphic organizer in a Lit. Discussion group! Thanks for sharing! I'm excited about using it! I like this Facebook timeline idea - I don't know if it would be too grown up for my 2nd graders, though. Clever idea to get them thinking about the main character. Probably. I'm guessing that there aren't any second graders on Facebook. I hope! Although it seems that a growing number of fifth graders are sending me friend requests. They're technically not supposed to have account until they're 13, but they tell me that they lie about their age. Guess all those lessons on integrity went to waste! I LOVE this idea! I actually did this in my class a few years ago with another graphic organizer (older fb setup though), and my kids thought it was so cool. It's a great way to see how much your students actually know about their characters. I'll have to download this and use it again! Great idea, thanks for sharing! I am just starting a Goosebumps unit this week for Halloween where all of the kids will be reading a different Goosebumps book and I was wondering how I would have them report out on their chapters. Love that this is quick and easy while still showing some general understanding. The kids are going to love it! I had no idea that you had to verify! Will try to figure out how to remove it. Thanks for letting me know!